Practically everyone uses the internet, but very few people actually know how it works. Google is looking to change this with murals that give viewers a look inside. When you open up a Google doc, a picture, search the web, translate languages, or download information, you’re sending requests to data centers through “the cloud”. This “cloud” is stored in data centers all over America. These buildings are no different than any other buildings around them, and most people have never looked at these buildings that are becoming a huge cornerstone of modern life. 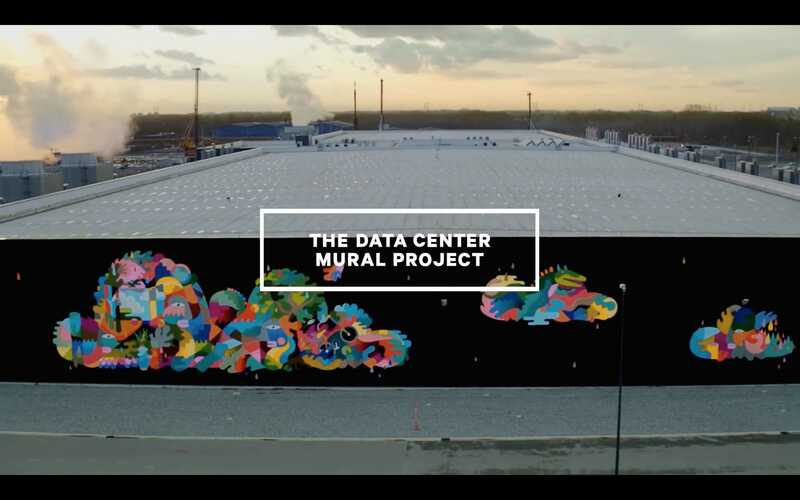 Google’s blog highlights Google’s goal of allowing muralists to partner up with Google to help show just how magical a data center can be (including the very unique Google corporate structure). You can watch the whole video below; which pretty much says how they plan on starting with just two data centers (one in Mayes County, Oklahoma, and the just outside of St. Ghilain in Belgium). Jenny Odell (painting in Oklahoma) designed her mural from Google satellites, showing how this infrastructure controls how we travel, deliver goods and information, and understand the flow of goods (which is just like a data center, according to Google). Oli-B (a Belgium local street artist) decided to paint clouds, to represent the invisible networks that we all use. He also decided to incorporate free roaming sheep that travel around the grounds in Belgium, as well as balloons from the annual L’Ascention festival. Google plans on painting on two more data centers; eventually painting on all of their buildings,all over the world. The suggest you check out more stuff that they’re planning by going to this link. Jo Kava, the VP at Google Data Centers says that this is definitely something to keep your eyes on in the upcoming years. We expect these art murals to become a very accepted part of our modern culture and understanding of data.